I recently installed a No Ground Plane CB antenna above the drivers door (side of nose cap). There was a post in 2013 by Go Phoenix that shows a picture of a similar installation. I was able to access the antenna cable from the storage cabinet above the drivers seat. I noticed there was no insulation in the cavity of that area of the cone. I thought that transition area from coach to cab had a foil wrapped fiberglass insulation or something similar? Does anyone know if this area would normally have insulation.....or if it was missed on our coach? I should note, I used an electrical plate with a hole for cable to finish the inside of the cabinet. The hole for the plate was large enough to confirm with certainty that there is no insulation. On my first PC I noticed how warm it got in the two storage areas above the driver and passenger. So I put my hand in behind the wall board and found no insulation, just the outside fiberglass and it was hot with the sun beating on it. On my subsequent PC purchases (first 2552 and now the 2551) I requested PC to install insulation in that area. For some reason they do not install insulation in that area, I believe just to be an oversight that no one follows up on. You can get some insulation and force it in that area without too much trouble. It really helps to keep the heat from baking those areas. Before it is asked, the reason we went from the first 2552, specifically made for us, to a 2551, was the gas mileage. We were averaging 5.3 mpg on the 2552. The Ford Dealer said that was very bad but they could not find anything wrong with the engine. Could not afford to drive a lot at that mileage. Our Roadtrek 210 tripled that mileage but wife wanted more room, so back to a 2551 and its mileage doubled the 2552, so there was something wrong with that engine. We average between 9 and 10.5 mpg, not good but acceptable compared to the 5.3. Those that claim 12+ mpg must have very good engines as I can only get 12 on the flats, with a tailwind and below 55 mph and I do not tow. Bob, I too noticed how hot the cabinets on either side of the TV were, and I can touch bare fiberglass with my fingers when I reach behind the inside cabinet wall. One of the items on my list is to get some insulation into this cavity, and I would appreciate any advice from anyone who has added insulation as to what they used and how they accomplished it. The main insulation does not cover the sides as shown in this picture. I don't know if they add separate pieces on the sides. I would hope they do. Having had four PC's, I know there is no insulation on the sides. The first one had no insulation so I added on the build sheet to place insulation in those areas. When at the factory I checked a couple of finished coaches and found no insulation in that area. It should be fairly easy to stuff some foam or fiberglass insulation behind the wall in that area. It will really help. Thanks Bob for the confirmation. I wonder why they don't have that nice prefabricated insulation blanket covering the entire cap area, in whole or in sections? In that picture, I see the worker needing the bare wall to tape wires. 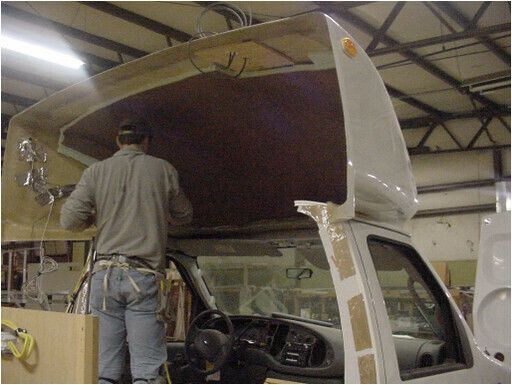 But once done it would have been easy to add insulation before installing the inside finish panels. If we did a lot of winter camping, I would consider pulling back the two inside finish panels and tuck in squares of R11 insulation. Realizing that there was no insulation in the front cap sides in my first PC I blew some expandable foam into the cavity. Subsequently, I noticed some slight dimpling in the fiberglass I always wondered if perhaps the expansion/contraction rate is different between the fiberglass and foam? I wonder if there might be a reason why PC does not insulate that area more? ths. Without an escape route, that foam can be very destructive.